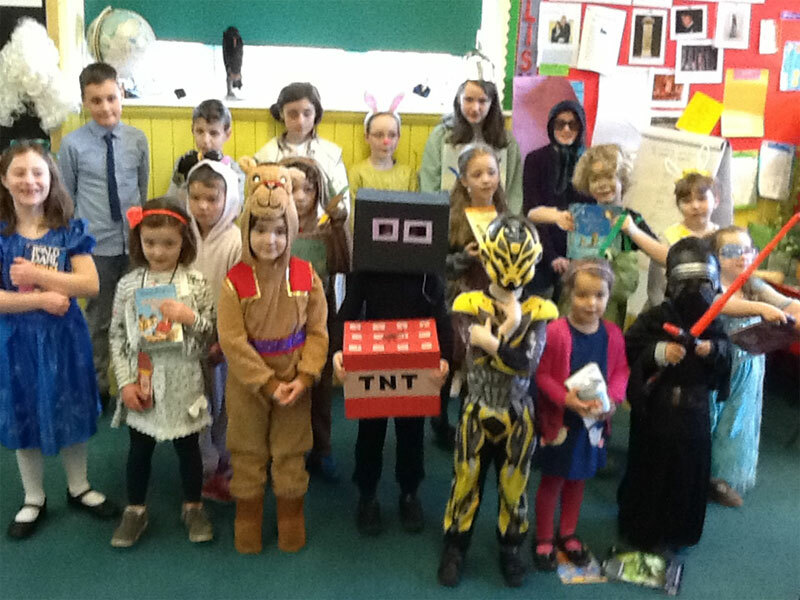 Trewidland School celebrated World Book Day by dressing up as their favourite book character. There was a range of characters from traditional fairy tales and stories, to modern ones such as ‘The Gangsta Granny’ and ‘Billionaire Boy’ and Amber from ‘The Midnight Gang’. First, they gathered together and paraded around the classroom (with music) to show off their costumes and for Mrs Moran to choose winners for the best costumes. She liked ‘home-made’ details, such as Hannah’s tiger food tin, Rebecca’s Tin Man costume and Margaret’s face painted injuries. She was very impressed with the effort everyone had gone to with their costumes and admitted that she had a hard task to choose a winner. Then, Class 2 wrote a character description for their character, year 2 drew a picture of their character and added adjectives (or noun and adjective phrases) and reception drew their character. Miss Ellis – with the help of some of class 1 – read the story of Jack and the Beanstalk. Class 1 helpers acted out the story using puppets. Following on from that, they made a ‘conscience alley’ to help Jack with his decisions. After that, they were mixed up into groups of 4 or 5 to create and retell a made up story which involved all of their characters. It was quite interesting to watch the stories from others’ imaginations, such as involving a camel and a ‘baddie’ character from Star Wars. Other activities included: the Post-it note game (guess the character), book token design for the national competition and Mrs Moran’s book survey in the library. Overall, they had a brilliant day. It was also a good way to encourage the children to read more. Also, they loved working together as a whole school for the various activities.